Grosvenor Crescent in London is the most expensive street in England and Wales with an average price of £16.9 million, according to new research. Overall, there are six streets with an average house price of over £10 million, all in the London boroughs of Westminster and Kensington and Chelsea, the data from Lloyds Bank shows. Grosvenor Crescent, located in the heart of Belgravia between Hyde Park Corner and Belgravia Square, an areas that has long attracted wealthy buyers due to its graceful white stucco residences, sweeping crescents, private garden squares and closeness to all the amenities of close by Knightsbridge, Pimlico and Chelsea, says the research report. The second most expensive street is Ilchester Place in Holland Park, with an average house price of £16,700,000. Holland Park in the borough of Kensington and Chelsea also has an affluent and fashionable reputation with many large period residencies that attract the rich and famous. 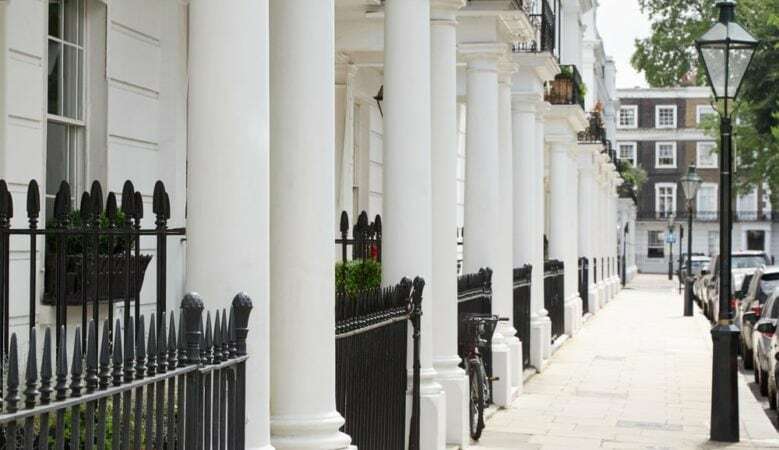 Eaton Square, last year’s most expensive street, is now third with an average price of £13,585,000, down from £17 million last year, followed by Chester Square at £12,534,000, Carlyle Square at £11,618,000 and Kensington Road at £10,185,000. Seven of the top 20 most expensive streets in England and Wales are based in Surrey. Three are in Weybridge with East Road at £5,053,000, West Road at £4,578,000 and Cavendish Road at £3,881,000. Leatherhead has two with Queens Drive at £4,222,000 and Leys Road at £3,749,000 while the remaining two are Gorse Hill Road in Virginia Water at £3,727,000 and Icklingham Road in Cobham at £3,559,000. Charlbury Road at £4,470,000 and Crick Road at £3,978,000 in Oxford and Panorama Road in the Sandbanks area of Poole at £2,361,000 complete the top 20. Outside of London and the South East, the most expensive streets are in, or close to, Sandbanks in Poole. After Panorama Road, the most expensive street is Bury Road in Canford Cliffs with an average price of £2,266,000, followed by Sandbanks Road at £2,180,000, Western Avenue at £2,155,000 and Haig Avenue at £2,108,000. In Northern England, Congleton Road in Alderley Edge is the most expensive street with an average of £1,985,000 followed by Park Drive in Altrincham in £1,820,000. In the North East the majority of the most expensive streets are located in Newcastle with Runnymede Road at £1,111,000 and Montagu Avenue at £1,048,000. Whilst in the West Midlands, Roman Road in Sutton Coldfield at £1,481,000 and Widney Manor Road in Sollihull at £1,386,000 are the two priciest addresses. In Wales, St. Annes Close in Swansea is top with an average price of £1,029,000 followed by Twyncyn in Dinas Powys at £813,000. Fulwith Mill Lane in Harrogate has the most expensive homes in Yorkshire and the Humber at £1,545,000. Warren Hill in Newtown Linford in Leicester is the most expensive street in the East Midlands with an average price of £1,288,000. ‘The prime London boroughs of Westminster and Kensington and Chelsea continue to reign supreme with Britain’s most expensive streets. Six addresses in the two boroughs come with a price tag of over £10 million with the top two over £16 million,’ said Andrew Mason, mortgage products director at Lloyds Bank. ‘As expected, addresses in London and the South East top the list of most expensive places to live, our research shows that all other regions have at least one £1 million street. Away from London, the survey shows that the most expensive streets are tightly clustered within Cheshire, Yorkshire and the Humber and Sandbanks in Dorset on the South coast,’ he added.